On the Friday before the hurricane was due to hit New Jersey, Joseph's House began talking about our response to what appeared to be a massive storm tracking directly for our coast. 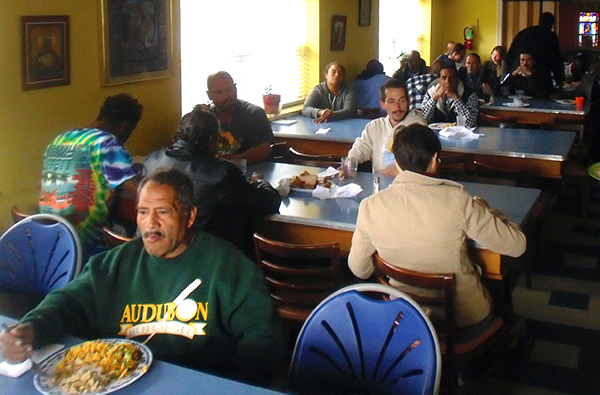 We decided to join the relief efforts in Camden by offering emergency food and shelter as we do in our Café Program. So, in partnership with St. Joseph Pro-Cathedral and the City of Camden Office of Emergency Management, 53 residents of the tent cities in Camden found shelter with us on Monday, October 29 into Tuesday, October 30. This was a real team effort. 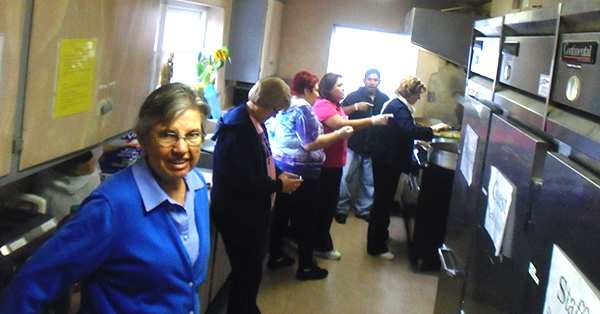 The City was quick to respond to the needs of the homeless and showed sensitivity in working to transport them from tent city to St. Joseph Pro-Cathedral School in East Camden, which in turn opened its cafeteria and gymnasium to serve as overnight quarters and to provide meals and emergency supplies. The Romero Center staff put out an urgent request for help on their website and social media outlets, and as a result volunteers and donations started pouring in. Joseph's House staff stayed in contact with the City to coordinate when people would arrive, how many were coming, and how security could be maintained. By the time the state of emergency was lifted in the City of Camden on Tuesday, 53 people had been sheltered, served a hot meal in the dining room of the Romero Center, and made to feel like family by 19 volunteers who selflessly and compassionately greeted our guests and remained with them throughout the storm. So many pieces had to come together so quickly to make this happen. In the words of Peter, 'It is good for us to be here'. Once again, Joseph's House witnessed the wonder and beauty of people coming together to be neighbor to one another. This time it was the storm that served to bring us together; in the past it has been the frigid temperatures, poverty, abusive relationships… But whatever the event, when people connect in a spirit of compassion and service to one another, it reveals the wholeness and the mystery of life. And it's a wonderful thing to behold.